Oy vey! I must say, it’s been a long three weeks. I have been traveling pretty much nonstop and then my parents came into town for a visit. It’s been killing me that I haven’t had time to post this review until now, but something just had to give. I mean you guys deserve the skinny on the District’s phat brunch. I went to meet my friend Laura (of Fore Front Fashion fame) to borrow some clothes for my upcoming vacation and grab mimosas and brunch. We strolled down to Caiola’s, but those jokers are closed on Saturdays for brunch. We did some quick improvising and I called to make sure District would be open before heading down to their Danforth St. location. Thankfully they were! We dragged ourselves there teetering on the brink of starvation. It was 11:00 a.m. and we were seated right away. The place wasn’t too packed and I was starting to wonder if people even knew they were open for brunch. The ambiance is bright, but definitely had a pub like feel with a visible bar and wood high top tables. I must say upon first glance around I wasn’t really expecting too much. We ordered two mimosas to start before deliberating over the menu choices. Their menu is adequate, with something to satisfy practically anyone. 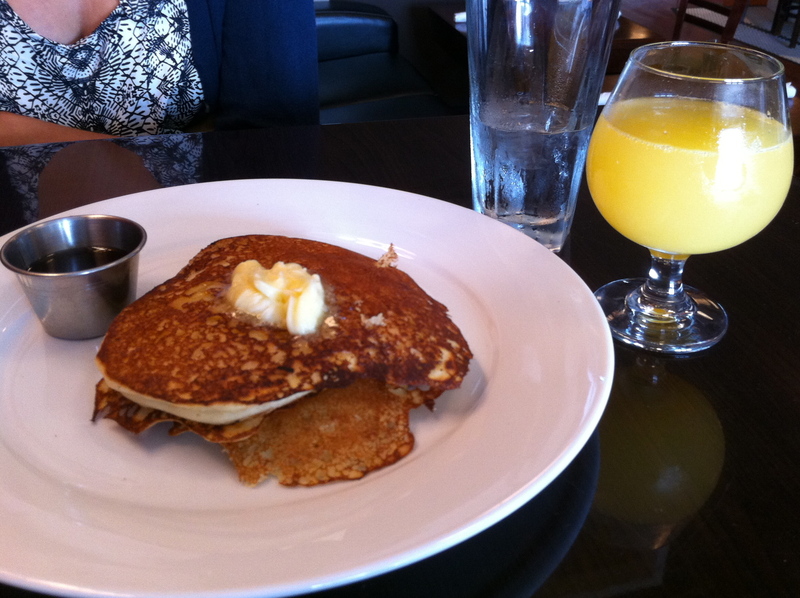 Laura jumped on the Ricotta Pancakes bandwagon. 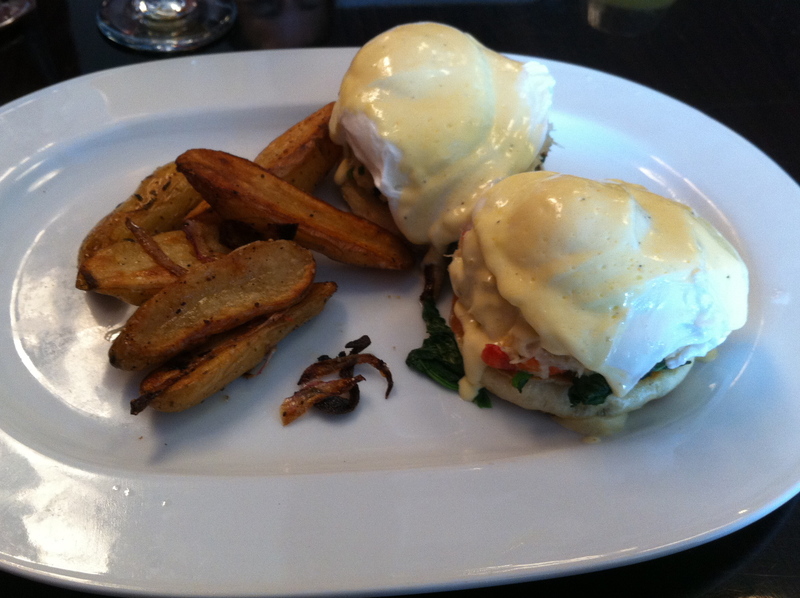 I, on the other hand, was intrigued by the Maine Crab Benedict with broccoli rabe and spicy lemon hollandaise. I was completely blown away by how great all these flavors paired together! The crab cake was unlike any I have had in Maine, it wasn’t fried to a crisp and filled with breading—it seemed to be 100% crab meat. Add that to the broccoli rabe, drizzle on the lemon hollandaise and dig in! The flavors just melted in my mouth. It was total brunch euphoria. 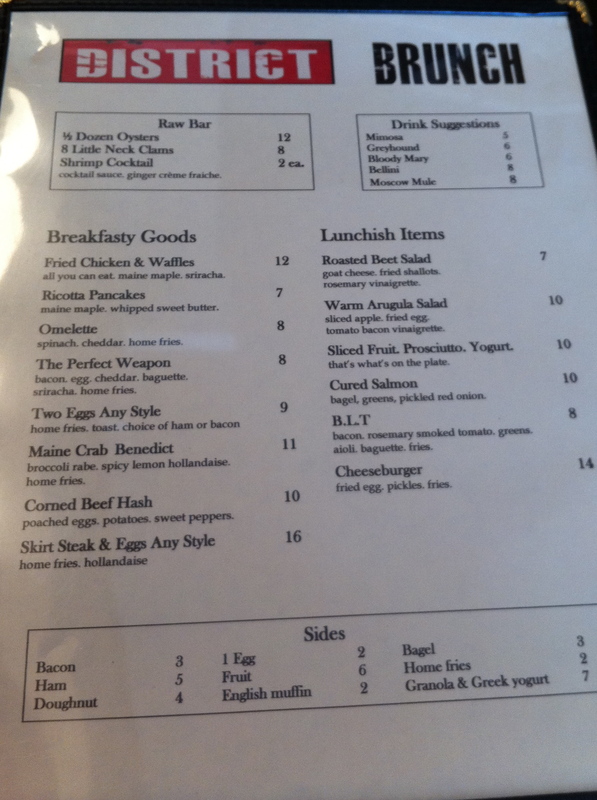 If you are looking for a solid brunch at great prices get in to District as soon as you can, before everyone in town finds out how good it is. I speculate that by this time next year we won’t be getting seated right away at 11 a.m. on a Saturday.